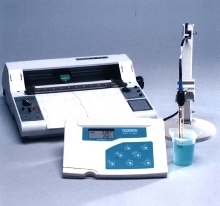 pH Meter offers pH, ORP, and temperature measurement. Less sensitive to electronic noise, OAKTON pH 510 benchtop meter provides stable, repeatable readings. It includes quick reference, slide out instruction card, dual display/hold function that freezes readings, and memory storage that stores and recalls up to 50 measurements. Water-resistant membrane keypad protects meter from accidental spills. Meter is available with manual or automatic temperature compensation. Vernon Hills, Ill.-Cole-Parmer Instrument Company introduces the OAKTON pH 510 benchtop meter, which offers pH, ORP, and temperature measurement in one, convenient meter. The pH 510 is ideal for water quality, chemical testing, industrial, educational, and laboratory applications. This benchtop meter is less sensitive to electronic noise, which provides you with stable, repeatable readings. The quick reference, slide out instruction card makes this meter easy to use, so you will be ready to take measurements in minutes. The pH 510 Meter features a dual display, hold function that freezes readings, and memory storage that stores and recalls up to 50 measurements. The water-resistant membrane keypad protects the meter from accidental spills. Choose from manual or automatic temperature compensation for highest accuracy in any situation. Use the analog recorder output to create hard copy records of all your data. Models are available with built-in electrode stand, which holds the electrode firmly in place. For more information, stop by booth #464 at the Pittsburgh Conference (PITTCON) at the Morial Convention Center in New Orleans, La., March 17-22, 2002. Contact Cole-Parmer Instrument Company, 625 East Bunker Court, Vernon Hills, 1I1. 60061. In the U.S.A. or Canada, call toll-free 800-323-4340. International customers can call 847-549-7600. Visit us on the Internet at coleparmer.com.